DIGS: /B-Dawg Edition: B-Dawg the hip hop happening pup gives a tour of his home to kid reporter G.
“Roam” Music Video: A re-make of The B-52s song performed by Caroline Sunshine, Kenton Duty and Adam Irigoyen from the cast of the Disney Channel hit series “Shake It Up”. Bridget and I sat down together this past weekend to watch this movie. She’s 7 years old and loves animals so I knew she would like it. I was right- she did! So much so that when the movie ended she started it over to watch again! Bridget loved the puppies and the two talking monkeys. She laughed at the scene in the desert where the puppies and the camel leading the way were trying to catch up with their master and the ran across a big pile of camel poop. It was amusing that right after they discovered it they set up camp in the same spot! Another funny scene was when one of the puppies saw a mirage of a huge feast in the middle of the desert. He ran over and started rolling around in the “food” like crazy. To everyone else it was just sand and it was funny to see puppy trying to eat the sand believing it to be a hotdog. I know this will be one that Bridget will be watching again. 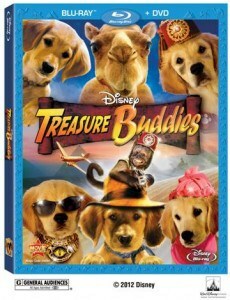 If you have a young child who likes animals, then pick up Treasure Buddies. Even as a adult I enjoyed it and had a few good laughs!